Readers of the blog come from all over the world and they may have heard some surprising tidings from the United Kingdom over the last few weeks. As most of international news reporting has painted events as either a revolt by xenophobic peasants or just complete chaos, I thought it was worth setting down what has really happened and the reasons behind it. First, my biases. Although I am, I suppose, a member of the globalised neo-liberal order, I campaigned hard in my local area for a vote to leave the European Union, commonly called the EU, at the referendum on 23 June. I have been a sceptic of the EU since 16 September 1992, ‘black Wednesday’ when the German central bank provoked the markets to devalue the British pound against the will of the British Government. In the meantime, we have seen the EU bring in the single currency that, in the aftermath of the financial crisis of 2008 has turned into a rack upon which the economies of many of its members are slowly being broken. In essence, the EU has become an oligarchy, and not even a very effective one. Second, some history: back in 1975, the British overwhelmingly endorsed their membership of the European Economic Community or EEC, the predecessor organisation of the EU. On balance, the British decided that membership of a huge market on their doorstep was worth sacrificing some of their self-rule for. Besides, back in the 1970s, the UK was in a bad way, with widespread labour disputes, high inflation and shaky Government finances. However, in 1992, the EEC was turned into the European Union by the Maastricht Treaty, which was intended to be the first step towards a federal United States of Europe. The British Prime Minister at the time, John Major, declined to obtain a democratic mandate for this. The previous Prime Minister, Margaret Thatcher, had been deposed a couple of years before when she effectively threatened to veto the plans for a federal Europe. The combination of Maastricht and Black Wednesday turned the majority of the Conservative Party against the EU. They also destroyed the credibility of Mr Major and his Government, which lost the 1997 election by a landslide. From 1997 to 2010, Tony Blair’s Labour Party was in Government and was determined that the UK would play a full part in the EU. In 2005, in an effort to increase the democratic legitimacy of the EU, a series of countries held referendums on its new constitutional treaty, which was a further step towards a federal Europe. However, when the EU lost the votes in France and the Netherlands, the results were ignored and the constitutional treaty was pushed through anyway with a different name. Both Mr Blair and the new Conservative leader, David Cameron, also promised a referendum on the constitutional treaty but both reneged when it became politically inconvenient to give the people a say. The grand plan to provide the EU with democratic legitimacy ended up destroying its credibility because the people declined to give the answer they were required to. In 2013, now in Government, Mr Cameron again promised a referendum. He said he would renegotiate the UK’s relationship with the EU before the referendum and then ask the people if they wanted to Leave or Remain, based on the new terms. He hinted that, if the negotiation didn’t go his way, he might campaign to Leave. But when his negotiations duly failed to achieve anything of substance in February 2016, he announced he would, after all, campaign to Remain. His credibility as honest broker was instantly destroyed and British voters stopped listening to a word he said. They also got sick of every international bigwig, from President Obama downwards, telling the UK was doomed if it voted to Leave. On 23 June, we voted 17 million to 15 million to Leave the EU. Everything about the vote was a surprise. No one thought Leave would win. Even after the polls closed, the betting markets implied a 90% chance of a Remain vote. Turnout was 73%, the highest in a national vote for 25 years. In short, more of the British voted to Leave the EU than had ever voted for anything else in our history. So what happened and what happens next? The Leave vote was a coalition of three disparate groups. The campaign was led by a relatively small group of internationalist libertarians, including Boris Johnson, Michael Gove and Daniel Hannan. They saw the EU (correctly, in my view) as an anti-democratic and corporatist racket that was immune to reform, as the failure of Mr Cameron’s renegotiation had shown. The shock troops for Leave were supporters of Nigel Farage and the UK Independence Party: mainly paleo-conservatives who objected to uncontrolled immigration (the UK must accept unlimited numbers of immigrants from the EU). The third element of the coalition for Leave was whose participation nobody could predict in advance. It was also the one that all my local canvassing was aimed at winning over. This final group consisted of working class people who nominally supported the Labour Party, but in practice rarely voted. Sick and tired of being ignored, and not seeing the benefits of globalisation, they came out to vote on 23 June and delivered the verdict of Brexit. Now the UK embarks on an exciting journey. We will continue to trade freely with the EU, but also sign free trade deals with the rest of the world as fast as we can. We’ll continue to welcome many new immigrants to the UK, but they won’t have an automatic right to reside here. And the democratic control of farm subsidies, fisheries and taxation (the UK currently can’t even abolish the tax on sanitary towels) will return to Westminster. Of course, plenty of the British have valid concerns about the effects of Brexit. And it is to be expected that many people will have invested in the status quo of EU membership, especially if the status quo has lasted for over 40 years. That does not make it a good thing. Indeed, institutional inertia and the fear of short-term consequences over long-term benefits is one of the most damaging of political motivations. As for the rest of the EU, it needs to reform quickly to gain democratic legitimacy while also, somehow, undoing the immense damage done by the single currency. Is that possible? Probably not. But we British wish the EU well. With Brexit, we cease to be a truculent tenant and become a friendly neighbour. My first book was just published. It's about the various arguments to the effect that determinism and/or naturalism are self-defeating. You can read a goodly portion of the first chapter on the publisher's website, on Amazon, and on GoogleBooks. It's kind of spendy -- sorry. Feel free to ask your library for a copy. I just read a great short story that some of you might like. It's a combination detective story, hard science fiction, and the history of science called "The Weighing of Ayre" by Gregory Feeley. The link gives the various books it's appeared in; I have it in The Year's Best Science Fiction, vol. 14. It's about 20 years old, but it's new to me. The account of Noah and the flood is one of those Bible passages held up as being inconsistent with contemporary science -- probably only the creation account receives more fire. In fact young-earth creationists use the flood accounts to justify their positions. According to them, all the geological strata, along with the fossils embedded in them, were laid down by the flood. Some even suggest that the earth was much smoother at the time of the flood and that the mountain ranges formed during it. This is why young-earth creationism is often called "flood geology". The anti-science impression is compounded by how the young-earth folk tie the flood account to the creation account: on the second day of creation, God separated the waters above from the waters below. The waters above, they contend, refers to a primeval water canopy that surrounded the earth which created a sort of tropical paradise where it never rained (as claimed in Genesis 2:5). The flood took place when this canopy collapsed and fell to the earth. Now, as far as I can tell, the only part of this scenario that was widely accepted prior to the mid-19th century is the claim that the flood was global. I'll deal with that issue in part 2. For now I'll focus on the other issues. The concept of a primeval water canopy comes from the visions of Ellen White which started in the 1840s and which formed the basis for Seventh-Day Adventism. Seventh-Day Adventism was originally a cult as they considered White's visions to be as authoritative as the Bible. They have since backed away from that stance and are generally considered to be an authentic Christian denomination today -- although I note that Walter Martin, in his magisterial The Kingdom of the Cults, had a 100-page appendix entitled "The Puzzle of Seventh-Day Adventism". Contemporary young-earth creationism is virtually identical to -- and historically derived from -- White's visions. However, I'm going to ignore the dubious provenance of young-earth creationism in order to focus on some of the problems with how it uses the flood to create an alternative view of earth's history. With regards to the water canopy theory, they point out that the Bible states that the waters were separated to be above and below an expanse, which the text specifically defines as the sky or heavens (שָׁמָ֑יִם). This term had numerous meanings in ancient Hebrew: the Bible uses it to refer to the air or space around us (I owe this point to Dallas Willard's comments in The Divine Conspiracy, chapter 3), the air or space above us, the earth’s atmosphere, outer space, or the spiritual realm where God dwells. Thus one could correctly say that birds fly in the heavens, clouds float in the heavens, stars shine in the heavens, and angels dwell in the heavens. The spiritual heavens are themselves divided further into the seven heavens, not just in Jewish tradition, but in many ancient cosmologies. In order to defend the canopy theory, one would have to say that the expanse (that is, the heavens) refers specifically to the earth's atmosphere. But I think it is more plausible that it refers to the air or space that is around and above us, and that the waters above them simply refers to clouds and precipitation. My reasoning for this is that, first, if the phrase "the waters above" does not refer to something common in our experience (like precipitation, water that falls from above), then it is completely obscure. Genesis 1 does not define what "the waters above" is, so if it is not meant to refer to an aspect of our common experience (just as "the waters below" refers to rivers, lakes, oceans, and their underground sources), it could be forced to mean nearly anything. Second, there is biblical evidence against the canopy theory. The text says that when the flood abated, the waters returned (וַיָּשֻׁ֧בוּ) to where they had been prior to the flood (Genesis 8:3). Therefore, if the water had originated in a canopy, it would have returned to form another canopy after the flood. Since the water did not reform into a water canopy that surrounded the earth, the floodwaters did not originate in such a canopy. In fact there are other Bible passages which show that the waters above refers to clouds and precipitation. Proverbs 3:19-20 states that "By wisdom the LORD laid the earth's foundations, by understanding he set the heavens in place; by his knowledge the deeps were divided, and the clouds let drop the dew." Referring to God's laying of the earth's foundations and setting the heavens in place clearly hearkens back to the creation account in Genesis 1. "The deeps were divided" sounds exactly like the separation of the waters below from the waters above ("the deeps" and "the deep" are common references to oceans and water in the Bible, even in Genesis 1 -- "darkness was over the surface of the deep"), and "the clouds let drop the dew" obviously refers to precipitation. Similarly, Proverbs 8:27-29 states "I was there when he set the heavens in place, when he marked out the horizon on the face of the deep, when he established the clouds above and fixed securely the fountains of the deep." Again, "when he set the heavens in place" clearly refers back to the creation account in Genesis 1, and "clouds above" and "fountains of the deep" immediately brings to mind the concept of the waters above and the waters below, which would entail that the waters above refer to clouds. The other passage offered is Genesis 9:13-17 which states that God set the rainbow in the sky to represent his promise to never destroy the earth's population by flood again. This supposedly implies that there had been no rainbows prior to this, and hence, it had never rained. However, whenever God makes a covenant with people in the Bible, he takes something they're already familiar with and says, in effect, "From now on this represents my covenant with you" (other examples being baptism, circumcision, animal blood, and bread and wine). So Genesis 9:13-17 shouldn't be understood as saying that there had never been any rainbows, but that they were to represent God's covenant from that point on. Therefore, I conclude there is no biblical reason to suggest that the flood was the first time it rained on the earth, and that the passages from Proverbs mentioned above show that there are biblical reasons to think it had rained before. The claim that the earth's landmass was smoother before the flood is not based on the flood narrative itself, but on some translations of Psalm 104:6-8 (I'll discuss this psalm in more detail in part 2) which, in describing a separation of land from water, refer to the upheaval of the mountains rather than the recession of the waters. For example, the NASB translates vs. 8 as "The mountains rose; the valleys sank down To the place which You established for them"; and the ESV as "The mountains rose, the valleys sank down to the place that you appointed for them." In contrast, the KJV translates this verse as "They [the waters] go up by the mountains; they go down by the valleys unto the place which thou hast founded for them"; and the NIV as "they flowed over the mountains, they went down into the valleys, to the place you assigned for them." It is not clear whether the verbs refer to the waters or to the mountains and valleys. 1) Psalm 104 is a poetic reiteration of Genesis 1. Thus, verses 6-8 are not describing the events of the flood, but the events of creation week when God first formed dry land. So even if we should take these verses as referring to the mountains rising and valleys sinking, it's doing so in the context of creation week, not the flood. 2) Genesis 8:1-3 specifically states that during the flood it was the waters that receded, not the land that was raised. 3) To claim that over eleven miles of tectonic uplift (the difference between the deepest ocean chasm and the tallest mountain) could have taken place in a year's time (the duration of the flood) poses insurmountable problems. A magnitude six earthquake only creates two inches of uplift. Multiply this by 180 million. In such a situation, the passengers on board the ark could not have survived. Moreover, there would have been aftershocks which would have been powerful enough to completely wipe out the survivors. At this point, some will no doubt object that to say these things couldn't happen is simply to disbelieve in a God who performs miracles. Surely God could have uplifted the mountains supernaturally rather than through tectonic uplift so that the lives of those on board the ark were not threatened. Or surely he could have supernaturally preserved their lives, and supernaturally prevented the aftershocks from destroying the postdiluvian population. But the problem with these suggestions is not that they are miraculous; the problem with them is that they are ad hoc. That is, they are made in the absence of any biblical evidence in their favor, in order to retain the young-earth creationist / flood geology model. The more a theory goes beyond the given facts, the more ad hoc, or contrived, it is. It would be helpful to keep in mind Occam's Razor (the simplest hypothesis which explains all the data is the most likely to be correct), the Principle of Least Action (nature normally operates in such a way as to expend the minimum effort to accomplish a given result), and the theological principle of the Economy of Miracles (God has, in His omnipotence and omniscience, created a universe of high efficiency of operation and will not interfere in this operation supernaturally unless the natural principles are incapable of accomplishing His purpose in a specific situation), in attempting to explain the cause and results of the great Flood. Unfortunately, Morris violates these principles themselves, not least in The Genesis Flood, the book that launched the young-earth creationist movement in 1960 by introducing the Seventh-Day Adventist interpretation of Genesis (based on Ellen White's visions) to a broader Protestant audience. In it, Morris and his co-author John Whitcomb attempt to respond to the argument that the eight people on board the ark could not have fed, cared for, and cleaned up after more than a few thousand animals at most, by suggesting that many of the animals may have gone into hibernation. However, most of the animals taken on board wouldn’t normally hibernate, those that do would only do so for a season and not for the year that they were on the ark, and hibernating for such a significantly longer time would create severe health problems for the animals. Morris and Whitcomb then state that God could certainly have performed such an act, and that anyone who questions this doesn’t really have faith in a God of miracles. But of course, the objection to this is not that it is miraculous but that there is no biblical evidence that any of it happened. That is what makes it so implausible, that is what makes us groan and put our heads in our hands when we hear such contrived attempts to salvage a bad explanation, not the fact that it espouses a miraculous explanation. Update (10 July): A commenter argues that the flood geology model is not used by contemporary young-earth theorists. If so, I apologize. This post is actually based on some things I wrote about twenty years ago, so it's more than likely out of date. On one hand I could say that I know plenty of young-earth folk and they all accept the flood geology model, so it's still a relevant issue -- but on the other hand I absolutely loathe it when atheists critique the concept of God they insist is held by the average Christian rather than the official doctrines as worked out by theologians, philosophers, and logicians over the centuries. If you want to rebut a position, you address it in its strongest form. OK, I can finally exhale. I was going to start blogging more, then I had to review the proofs and compile the index for a book that's coming out in a couple months, and the stress was ... considerable. Actually, I still have a couple weeks before the end of the term, then I correct final exams, and then I can exhale. In the meantime, for your reading pleasure, I present you with "Pray the Lord My Mind to Keep" by Cornelius Plantinga. I've written some posts on the historical Jesus, although not recently. You can peruse them here (the link goes to my other blog, but many of them were cross-posted here) or you could look at my posts of interest and scroll down to "Historical Jesus" for the highlights reel. Enjoy. I noted in my previous blog post thatancient Greek science consisted of many different natural philosophies. In fact, it’s wrong to speak of Greek science in the singular. I’ve also noted in the past that if we judge Greek sciences by the standards of today (which, despite the anachronism, many people do), it was not very effective at generating true theories about the natural world. Finally, with few exceptions, science in the ancient world had no technological or practical applications. So, what was it for? That’s what I want to explain in this post. Each school of Greek philosophy, whether Aristotelian, Platonic, Stoic or Epicurean, had a particular ethical system. Philosophers of each school believed that their moral values were objectively true: that’s to say they could use them to tell the difference between right and wrong. For these Greeks, morality was not just a matter of opinion: it was a rational issue with correct answers. Of course, the schools disagreed on what the truth was, a point gleefully pointed out by the sceptics. Consider for a moment what it means for there to be objective moral values. It means that there is something about reality, outside human minds, that makes those values true. J.D. Mackie used the analogy of a game of chess. The rules of chess determine what is right and wrong in the universe of a chessboard. Whatever happens in a chess match as pieces are moved around, attack and defend, win or lose, ought to be consistent with the external rules the game. For any move, you can analyse whether this is true – you can get to ‘is’ from ‘ought’. Almost all philosophies of the past have treated moral values in the same way. For any given action or thought, they said, it is possible to determine through rational analysis whether it is consistent with objective moral values. For Platonists and Christians, the source of these values is external to nature, that is the ideal Form of the good or the nature of God respectively. Nonetheless, both Platonists and Christians both assume that this external factor, be it the Form or God, is reflected in physical reality. Their natural philosophies are intended to validate the existence of the source of external moral values. That’s why Christian natural philosophy is based on the universe as God’s creation, while Platonists emphasized how the perfect Forms could be discerned in nature by philosophical reflection. Aristotelians held that the function of humans was to live in line with virtue and that was the way to good living. This functionalist approach is reflected in Aristotle’s natural philosophy as well. He interpreted his famous observations of animals using this framework. His theory of natural motion states that even matter strives to reach its proper place and naturally moves towards it. To be happy, human beings must also adhere to the path that nature has laid out for them. The Stoics defined right living as being in harmony with nature, which they deified through a form of pantheism. Because they believed moral laws were built into the very structure of the universe, Stoics had no trouble treating them as part of objective reality. The essential point, though, is that the ethics of Stoicism informed their natural philosophy, even though they might argue that it was nature that gave rise to their ethics. Epicureans emphasised human freedom and so their natural philosophy demystified nature so that it provided a safe space for human choice. In his On the Nature of Things, Lucretius systematically runs through various phenomena to show how the free man has nothing to fear from them. Indeed, Epicurus himself said that once you understand a phenomenon sufficiently well to stop fearing it, you don’t need to delve any further. In a way, this is the opposite approach to the Stoics because the intention of Lucretius and Epicurus is to show that humans are objectively free. Nonetheless, this is still an ethical maxim and one that the Epicureans used to determine their natural philosophy. Once again, the ethical maxims were prior to the natural philosophy which served them. 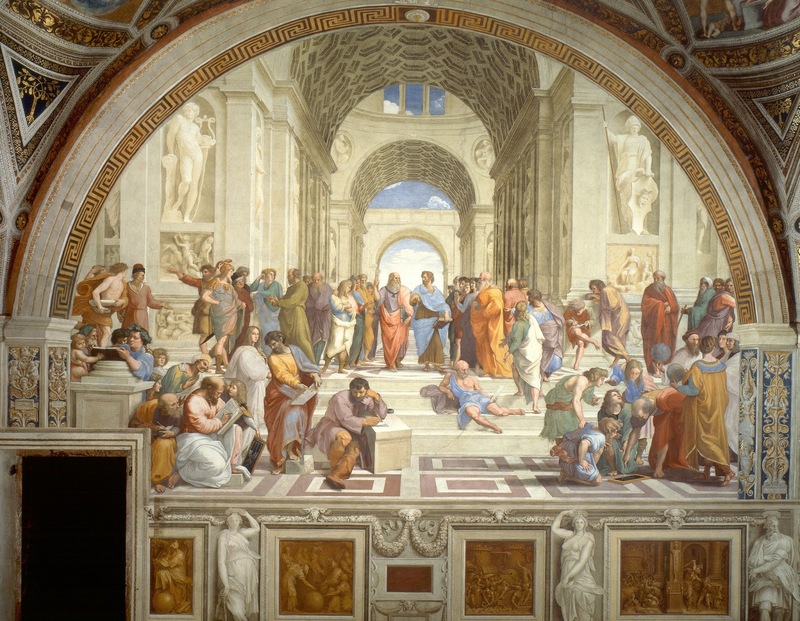 The primacy of ethics and the belief in objective moral values explains both the multiplicity of Greek natural philosophies and the differences between them. It also shows us how utterly unlike modern science Greek natural philosophy was. Finally, it illustrates that the Greek attitude towards science was identical to that of early and medieval Christians. David Lindberg was fond of a metaphor he found in the work of Roger Bacon – that natural philosophy was the handmaiden of Christian theology. For the pagan Greek philosophers, whether they were theists or not, science was the servant of ethics. Here in the States there was a political dust-up recently when one candidate accused another of advocating New York values instead of more broadly American values or rural values or Midwest values or whatever. I make no comment. But if you want to see a real send-up of New York values, read Michael Flynn's short story "Grave Reservations" from his collection The Forest of Time and Other Stories. It's absolutely brutal. In fact, one of the candidates in question receives a brief mention. I recently made a point in the comments over at Victor Reppert's blog that I think warrants fuller promotion. There is much to remark on regarding the debate between Daniel Dennett and Alvin Plantinga that took place several years ago and was then published as Science and Religion: Are They Compatible? Right now I just want to focus on the fact that Dennett does not understand the most basic elements of the view he is criticizing. The example of this that stood out for me is when he writes, "Plantinga didn't hypothesize that Jesus guided and orchestrated the course of evolution; he hypothesized that God did. God is not Jesus, and maybe God can do things that Jesus can't do" (p. 47). The obvious problem is that this flies in the face of the doctrines of the Trinity and the Incarnation. The Trinity states that God is three persons, one of whom is Jesus, and who share one essence. Jesus is not God the Father, nor is he God the Holy Spirit; he is God the Son, one of the three members of the Godhead. Certainly, this is an unusual doctrine and it's difficult to wrap one's head around it (if you doubt this, try explaining it to your kids), but it's not like it's unknown. Regarding the Incarnation, the whole idea there is that "God became man"; God (the Son) chose to be incarnated as a human being. Certainly there are religious groups who deny this for various reasons: ancient Arians denied it, contemporary Arians (Jehovah's Witnesses) deny it, Jews and Muslims deny it, etc. But orthodox Christians accept it, and again, it's a pretty well-known claim. "In the beginning was the Word, and the Word was with God and the Word was God." So the Trinity and the Incarnation are absolutely central to Christianity, yet Dennett writes that, according to Plantinga, "God is not Jesus, and maybe God can do things that Jesus can't do". I guess it's possible that Dennett is accusing Plantinga of denying these doctrines, but this would be the most subtly-phrased accusation of heresy I've ever heard, and Dennett is not known for subtlety. I guess it's also possible that Dennett could simply be speaking of himself: that he rejects the Christian claims of who Jesus is, but accepts the existence of God while denying God had anything to do with evolution. Except I read somewhere that Dennett doesn't believe in God, so I don't think that's the right answer either. Obviously Dennett is ascribing the claim "God is not Jesus, and maybe God can do things that Jesus can't do" to Christianity. And this is just to announce that he is unaware of the doctrines of the Trinity and the Incarnation. Yet Dennett feels himself fully capable of addressing the claims of Christianity regardless. Note that this wasn't part of his original response to Plantinga, which may have had some off-the-cuff elements to it (although he obviously prepared his response beforehand, since he didn't really address many of the specifics that Plantinga gives in his first speech). This was one of his prepared essays for the book that responded to the original debate. The point is that Dennett is not justified in even having an opinion here, much less expressing it, much less debating the subject. He simply doesn't know the first thing about it, his proud proclamations notwithstanding. This is not an accident by the way. A page later he writes, "the fact that it [Christianity] is an ancient tradition with many eminent contributors does not make it more deserving of attention than any other mythology" (p. 48). He doesn't have to pay any attention to it, nor should anyone else. Well, that's true, you don't have to pay attention to anything you don't want to. But when you don't pay any attention to something, you give up the right (the epistemic right, that is) to have an opinion about it and to make pronouncements about it. Since you haven't paid attention to it, you don't know anything about it, and if you don't know anything about it, you are not in a position to form a responsible opinion about it. I also have to point out that if there were "an ancient tradition with many eminent contributors" that struck me as so absurd as to be undeserving of attention, then I would assume that I was missing something and that it was in fact deserving of attention. If God does not exist, then certain elementary properties we ascribe to the mind can't be veridical. Therefore certain elementary properties we ascribe to the mind can't be veridical. Certain elementary properties we ascribe to the mind are veridical. Nevertheless, my affinity for him with regards to the first premise has nothing to do with his debate with Plantinga, and of course it in no way excuses him from his responsibilities to actually know the topics on which he pontificates. Not to mention that Plantinga, whether you agree with him or not, is kind of a powerhouse on this subject. To participate in a debate with someone like this without being willing to prepare for it in the most rudimentary way (by knowing the basic elements about the subject on which you're debating) should be more than a little embarrassing. It's tempting to say that Dennett brought a knife to a gunfight, but that gives him too much credit. Dennett brought a rubber chicken.